Dalani with one of her beloved kapa artworks. Do you know what kapa is? 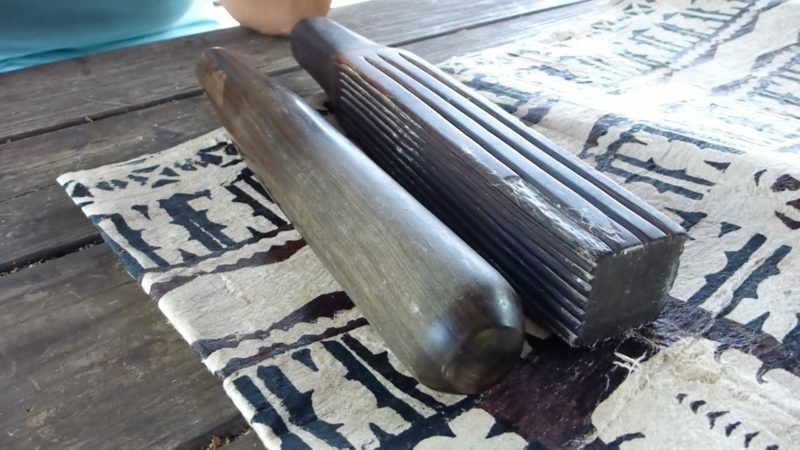 Most locals have heard of kapa and know of it, but the extent of their knowledge is tree bark that’s pounded flat into a fabric. If you were lucky, you had a “kapa” making class in elementary school where you beat paper bags together to form a cloth. As for myself, I have only one distinct memory of kapa in my childhood where I saw a drawing of some ancient Hawaiian women pounding kapa. And that was it. I’m sure I heard of kapa every so often after that, but I’ve never studied it, tried it or even touched it. Until today. Dalani Tanahy invited me into her home and work area and it was one of the coolest experiences I’ve ever had! She grows her own wauke trees that she uses for her kapa pieces and classes and she grows as many of her own kapa dyes as possible (I didn’t know you could dye kapa!). I even got a private tutoring on kapa pounding, which really gave me a workout! Dalani herself is just an amazing individual. When she speaks of kapa, her experiences and journeys with it, you can see her eyes glow with excitement and she has plenty of interesting kapa stories up her sleeve about teaching classes, her travels and kapa she created for customers. While speaking to her, I really got the sense that this is a woman who’s love for the work of kapa is evident, and who can be proud of what she has accomplished in the field of this rare Hawaiian art. Her interest in the history of Hawaiians, Polynesians and the story that the evolution of kapa tells is so strong that I found myself hooked in everything she had to say and had questions of my own about this tiny piece of Hawaiian culture. 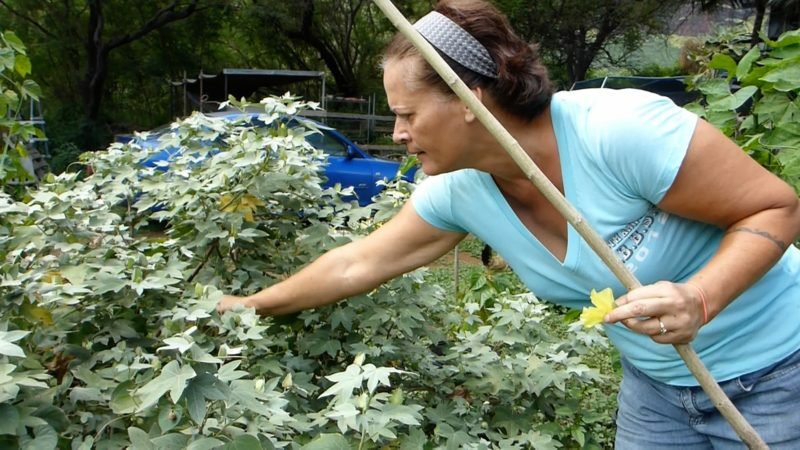 Picking the flowers of the native Hawaiian cotton plant for kapa dyeing. 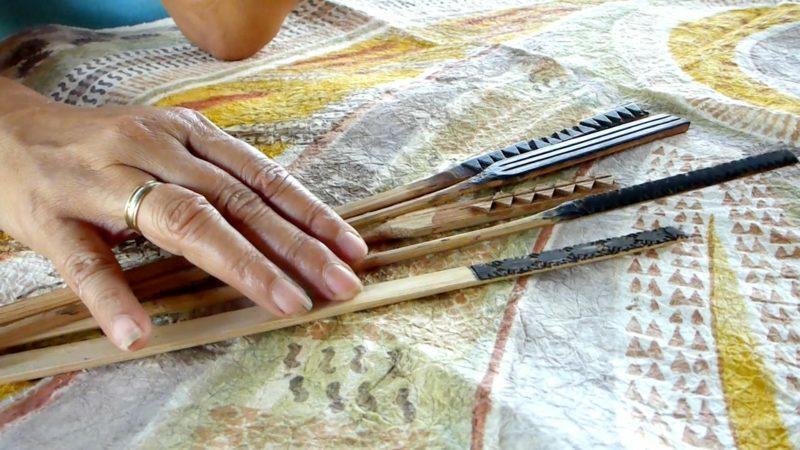 I also got a closeup look at several of Dalani’s handmade tools for kapa making. I was surprised to learn that only certain types of wood works well for the tools, which makes sense when you think about it. Stamping tools need to be able to absorb a variety of dyes and not crust up between the design notches. The dye also has to be transferred smoothly from stamp to kapa, which not every type of wood can do successfully. Even the beating tools need to be made of a specific wood in order to withstand the stress of being hit against a rock all day without splitting or warping. A private showing of Dalani’s handmade tools. Dalani even makes her own kapa pounders. Finally, my real lesson began by scraping the outer bark with a large opihi shell, which was sort of like peeling an extremely stiff carrot. Then Dalani handed me a “knife” that was made out of shark’s teeth. 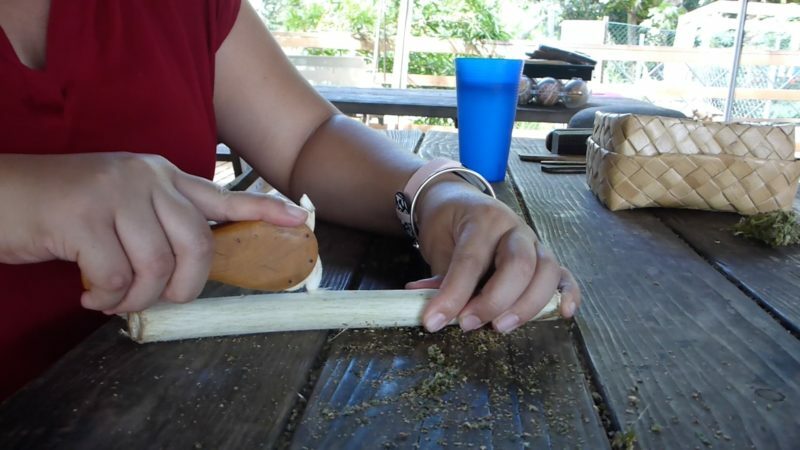 I used this tool to split the fibrous wall and peeled it off the inner rod of the wauke tree. Once that was off, Dalani had me beat the fibers for a good half hour until I had a very flat and even piece of of kapa. 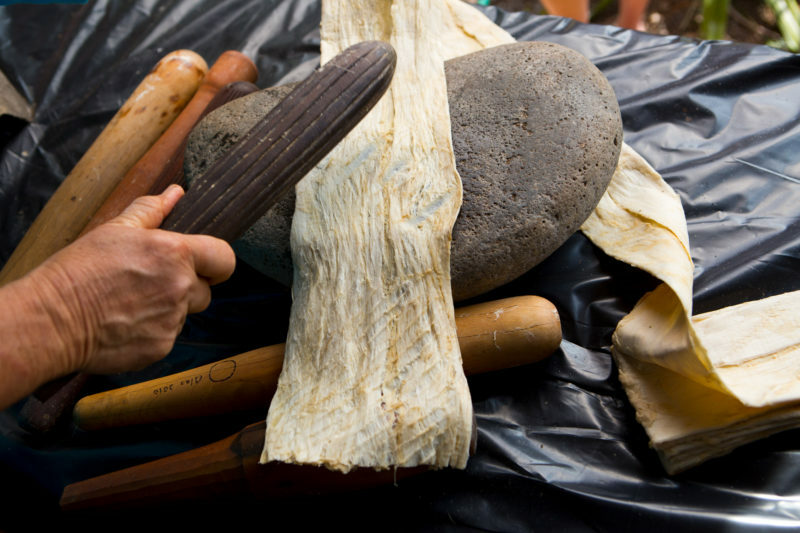 I will never know as much about kapa as Dalani does, but I can tell you one thing for sure that pounding wauke bark is an incredible workout for your shoulders! Splitting the outer rim of the wauke tree that will eventually be pounded into kapa. Me getting a private kapa pounding lesson from Dalani! I am so glad that I decided to reach out to Dalani and am grateful that she was such a welcoming person to allow me to come into her world and explore. I didn’t know what to expect since my knowledge of kapa was (and still is) so limited, but after my too short time with her, I feel like I’ve been missing out on so much of what Hawaii is. The Hawaiian culture is an incredible experience that very few people are exposed to. Even lifetime locals like me don’t often get the chance to appreciate what the Hawaiian culture offers to us freely if we just have the interest. 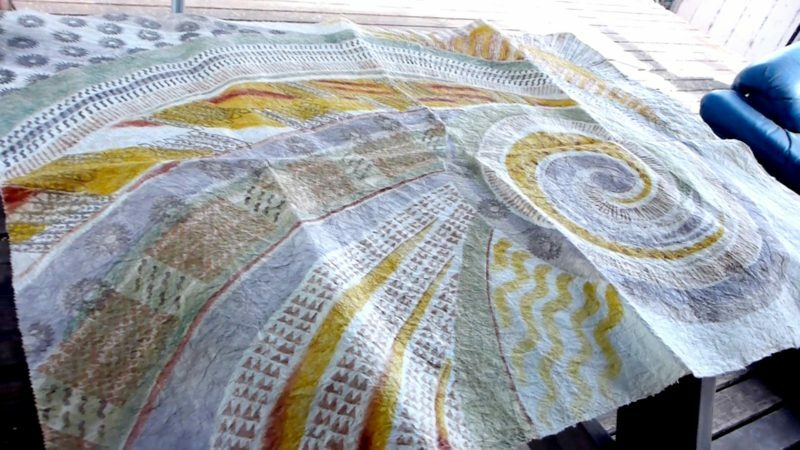 This was my favorite beautiful kapa piece that explored the variety of dye colors. Now if you have the interest, you can certainly contact Dalani because she does hold classes and even appears at expos or festivals worldwide from time to time. 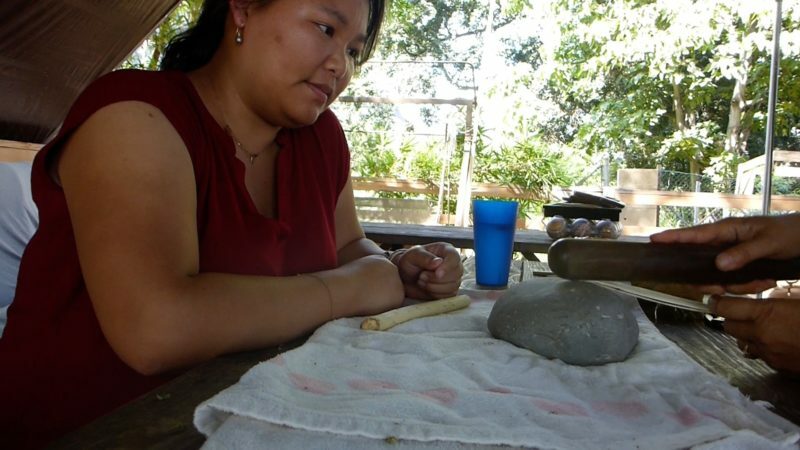 If you are a resident of Hawaii or plan to be in Hawaii for more than a year, I highly recommend her year-long class because true kapa making takes time. It requires a large space to make noise, plants to grow and believe it or not strong arms to train! Trust me, I know! But if you are visiting for just a short time, you can ask about a private kapa session. Dalani also takes custom orders if you’re interested in owning one of her beautiful works of art. You will possess a rare and one-of-a-kind item that is totally Hawaiian made and home grown from start to finish. Connect: Feel free to reach out to Dalani by email at [email protected] or click here to go to her website for more information.